Soft Robotics Inc. spun out of Harvard University surgical research and provides end effectors for handling varied, fragile items. Soft Robotics Inc., which makes robotic grippers inspired by octopus tentacles, has raised $3 million in Series A funding. The company, which won a Game Changer Award for best gripper at this year’s RoboBusiness conference, expects to add another $2 million soon. Cambridge, Mass.-based Soft Robotics was spun out of Harvard University’s Whitesides Research Group in 2013. The U.S. Department of Defense provided the initial funding for flexible surgical tools, but the robotic grippers turned out to be better suited for other tasks. The company’s soft fingers are filled with compressed air and can handle a variety of objects without damaging them. This is particularly useful in warehouses and in dealing with clothing, electronics, or fruits and vegetables. Four customers have completed pilot testing and are beginning to use Soft Robotics‘ grippers in production. One benefit of Soft Robotics’ flexible end effectors is that they can be easily sterilized for compliance with food-safety regulations. Leamington, Ontario-based Nature Fresh Farms is looking Soft Robotics hands for handling tomatoes. This past summer, Soft Robotics partnered with Heinzen Manufacturing International, which makes equipment for packaging produce for shipment to grocers. Gilroy, Calif.-based Heinzen Manufacturing also works with robotics manufacturer Yaskawa Motoman. Investors in Soft Robotics include the Material Impact Fund, Haiyin Capital, and Taylor Ventures LLC, whose parent company Salinas, Calif.-based Taylor Farms, is major vegetable grower. Soft Robotics expects to double its staff of five people and scale up to meet demand. As robots move into applications such as healthcare and logistics where they increasingly interact with humans, soft robotics are expected to make them more flexible and useful. The development of soft grippers allows robots to handle multiple and fragile objects without having to change out end effectors. Other researchers are working on similar grippers, including Rob Scharff, a graduate of the Delft University of Technology and a team at MIT’s Computer Science and Artificial Intelligence Laboratory. 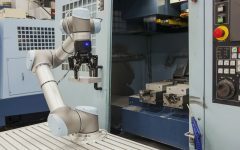 Other types of robotic grippers for industrial automation and packaging include those using precise but rigid fingers and vacuum or suction systems. Earlier this year, Grabit Inc. in Santa Clara, Calif., released its P-Series grippers. They use “electroadhesion” technology that uses static electricity for a variety of applications, including parts and package handling and picking circuit boards and fabric. Brooklyn, N.Y.-based prototyping company Super-Releaser this week described a 3D-printed soft robotic gripper to demonstrate the technology’s potential.